In the early Celtic faith this day was a holy day and a market day, a cross quarter holiday that celebrated the freshening of the ewes. When the ewes became pregnant–lamb in the belly, in the belly=imbolc, they would once again have milk, adding some variety to a food supply that had been stable since Samhain or so, the last harvest. Brigid, the Celtic triple-goddess of hearth, smithy and inspiration, all fire related–is the goddess honored on this holiday. She was, like so much of the old religions, hoovered up into Catholicism as St. Bridget, reportedly born of a good Christian woman and a Druid, thus straddling the transition from the old faith to the new. She had a center at Kildare in Ireland, where the Catholics built cell dara, or cell/church of the oak. A great oak was there. This Cathedral of St. Bridget went up in 480 ad. That is very early, the Roman Empire was not quite dead. Even so, the followers of the Goddess had been there much longer, with 19 priestesses who kept lit an eternal flame. Catholic nuns dedicated to St. Bridget kept up this practice until the Reformation era. “On February 1, 1807 Daniel Delany, Bishop of Kildare, began the restoration of the Sisterhood of St. Brigid. Their mission was to restore the ancient order and bring back the legacy and spirit of this amazing figure. In 1993, Brighid’s perpetual flame was finally re-kindled in Kildare’s Market Square by Mary Teresa Cullen, who at that time was the leader of the Brigidine Sisters. The sacred flame was kept by the Brigidine Sisters in their home and on February 1, 2006, the flame was brought back to the center of the Market Square where it has been permanently housed in a large glass enclosed vessel.” see website sourced above. There was, too, a holy well dedicated to Brigid, also in this same location. 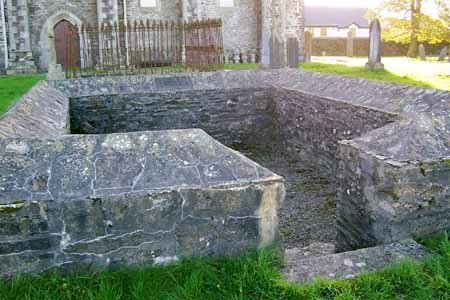 There are holy wells all over the Celtic lands, many dedicated to gods or goddesses, others revered as places for certain kinds of prayers, both blessings and curses. 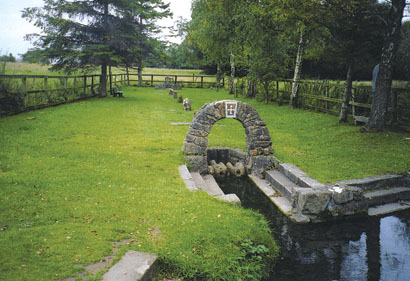 These wells have since ancient times been considered portals to Faery or to the Otherworld, thus offerings left by the wells honor those of Faery as well as those who have died. Dressing the well makes an offering at a holy well, i.e. surrounding it with flowers, plants, homemade things. The Celts also use strips of cloth tied onto tree or shrub branches as offerings in a fashion very similar to certain native american traditions. Given Brigit’s triple orientation–hearth, smithy and creative inspiration–today is a day to celebrate domestic life where the fire of the kitchen activates the home, and the fire of the smithy where the tools and weapons of a life lived close to the land are shaped, and, finally, the inspiration which comes to each of us from the holy wells deep within our own being. This is a time to stop, take a look at the home fires. How are they? It is also a time to think about the tools for gardening. Are they sharp and oiled, ready for the spring. Then, too, especially for those of us who rely on the mystery of creative inspiration, are you being careful to tend your inner well? Keeping it dressed and well-maintained? On the Great Wheel we have moved past winter now and have arrived in a season dedicated to Brigid, the triple goddess of smith, hearth and poetry. Her fiery inspiration fills the kitchen, the world of artisanry and of the poet. Her fertile presence in the world is also reflected in the name of this cross-quarter season, Imbolc, or in-the-belly. In Ireland of old this was the season when the ewes became pregnant, that is, had a lamb in-the-belly. This meant the ewes freshened and could be milked. After a season of bleakness and no growth fresh milk and the cheese made from it would have added a lot to the diet, protein and calcium in particular, and done it with no need to diminish stores or kill an animal. This was a seasonal miracle. In our time we can walk or ride to the grocery store and pick up a half gallon of milk in any season. Imagine what it would have been like to have had only stored vegetables, probably a lot of porridge made from whatever was still left in the root cellar or pantry, and then, suddenly, to have fresh milk. And cheese. A glorious thing, I’m sure. Today we might look in our pantry and check what’s almost gone. That is, what in your life has gone out of supply. Energy? Love? Imagination? Motivation? Friends? Family. Consider those the result of a fallow time, a winter of emotional or relational resources. We all have them at different times and in different seasons of our life. Look, then, for the new milk. What’s quickening in your life? Perhaps a new project. A new friend. Maybe a child. Could be a feeling of confidence, of new direction. What do you need, after the fresh milk has invigorated you to bring your little one into the world? More time to devote to it. More affection to bestow. More time with yourself for ideas to emerge? More time with family and friends to allow your relational life to blossom? Whatever it is, Brigid is the goddess who represents the creative force necessary to freshen your life. You might look at her and what she means. Google Brigid. There are lots of articles. Don’t get into the ontological question. Look at how a presence like Brigid might move into your life and give you new perspectives, new images, new paths. Open yourself to the things you need to have a fruitful and productive new year. The season awaits. This is the holy day of Bridgit, the triple goddess; she of the eternal fire at Kildare, a goddess who tends to the fire of creativity at home, for the poet and in the smithy, the place where things are made by hand. As with so many things Celtic, the Roman Catholics appropriate her, given her a birth story. Her father, the story goes, was a druid, her mother a good Catholic. She became a Catholic woman known for good deeds and miracles. After her death she became a saint. Many Catholics know her only as St. Bridgit, but her origins as a religious figure had their beginnings and much larger compass within the ancient Celtic faith. It was the Celts who first tended the eternal fire at Kildare, devoting men and women to the task. Later, in the days of the Celtic Christian church there was a double monastery there, men and women in separate units, abbot and abbess respectively. 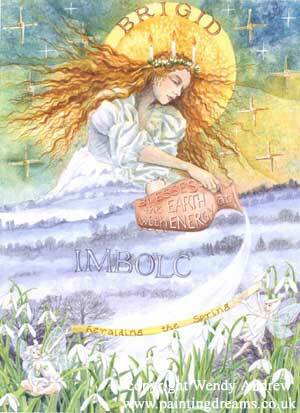 Imbolc itself means in-the-belly, referring, as I wrote a few days back, to the lamb in the belly of the ewes. The quickening of the ewes meant fresh milk. After at least three months + of stored food, little meat, and chill weather a small cup of milk or its use in cooking must have been a reason for great celebration. The lambs also were a reminder that the rebirth of spring would come again, just as they had come. Nature’s cycle could be trusted. We can buy green beans, strawberries, fresh fish, eggs, milk, butter, bread in a brightly lit store. Aisles and aisles of food, so many versions of cereal, peanut butter, spices and salts, rice and pasta, beef, turkey, chicken, pork and, yes, even lamb. In some vague way we know this food arrives at the grocery by truck, packed in cardboard boxes. The workers remove and open the boxes, distributing the food to shelves, meat counters, produce bins, milk coolers. We pick it up, put it in our carts, pay for it, then take it home and store it in cupboards, refrigerators, pantries. Until very recently there was not much attention given, at least by most of us, to the source of the food. The buy local movement has focused our attention especially on produce and meat. Was the beef grass raised? No antibiotics? The eggs. Were the chickens free range? The leeks and the tomatoes, the lettuce. Who grew it? How far did it travel? Is it organic? Did the salmon come wild from Alaska or farm-raised from the Atlantic? As we once again allow the blurred image of our food sources to come into focus, I hope we will also allow the blurred images we have of the natural world to come into focus. We may see that the sacred is not a notion found in texts, but in the world. We might feel our way toward the vitality of the dog, the raven, the oak, the tulip, even ourselves, a vitality that emerges, has its day and then absorbs back into the world; the universe represented here, for us, by our planet and its sun, by the web of life sustained by the inanimate, but also sacred world of rocks and water and air and fire. The Great Wheel, the cycle of solstices and equinoxes broken up the cross-quarter holydays of the Celts: Imbolc, Beltane, Lughnasa and Samhain turn us not outward or upward, not away from ourselves and our world, but inward and downward, toward ourselves and our world. These holydays root us in the changing world, that, paradoxically, changes back into the world of last year, each year. In this sense time for the Great Wheel cycles and recycles, never moving into tomorrow, always returning to yesterday. We need this reminder, the Great Wheel’s reminder, because we are so much in the grip of chronos, the swift moving river of time that sweeps us along towards the gulf of our mortality, a great dead zone at the end of this wonder we call life. The Great Wheel reminds us that while our life will end, life itself does not. That as we die, a birth occurs. As tears fall, laughter rings out. After the winter, the ewes will freshen, there will be milk. And flowers. Though daytime begins to gradually increase right after the Winter Solstice, it is not until Imbolc that we begin to see actual signs of life’s return. An early indication of life’s strong statement against the inertia of the cold comes as ewe’s become pregnant, have life within their bellies–imbolc. Not many of us (Gentlemen Jim Johnson excepted, of course) have pregnant sheep in our lives, so this early pointer to the green means little to us. The weather in Celtic lands had rain and chilly, but not cold, weather in these months, so the grass and plant life would begin to emerge. Here in Minnesota this week often has some of the coldest temperatures of the year and snow is far from unusual. The only U.S. ritual I know of directly related to Imbolc is Punxsutwaney Phil. Click this link for a direct immersion in this small Pennsylvania town which still celebrates an animal, the woodchuck, who comes up from a hole in the ground and checks the weather to give an indication of winter’s length. His prediction stretches out six weeks which takes us close to the time of the spring equinox on or about March 20th. In other words he predicts the weather during the season of Imbolc. It’s been a while since I’ve written about my favorite Celtic goddess, Brigit. This is her holiday and the candles in the picture here allude to the sacred fire, kept burning day and night, for at least 1,000 years and probably much longer, in her honor in the Irish county Kildare. 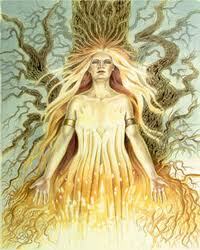 Brigit is a triple goddess, common in Celtic lore; she is the goddess of the smithy, the hearth and the poet. The link between these aspects of her is fire and creativity. The smith, in the time of the ancient Celts was a wonder worker, developing strong tools, weapons and jewelry for the people. The hearth is the center of domestic life and the Irish put it out once a year and relit it from a large bonfire built on the sacred hill at Tara. Finally, the poet, a crucial element in Celtic political and creative life, drew his or her inspiration from the holy fire of Brigit’s presence. Imbolc, called Candlemas by Catholics, is a good time to examine the creative projects in your life: at work, at home, in any location where you reach in to your Self and offer something back to the world. You may want Brigit to participate with you in that search, or you may want St. Brigit, the Catholic saint named after her. Live into this holiday and this creative season as a person on fire. When I came back to my Celtic roots during my transition out of the Presbyterian Ministry (the state church of a Celtic country), Brighid became central to the spirituality I began to develop. As a fire goddess, her Imbolc celebration symbolizes the quickening of the earth as the reign of the Caillieach, the crone, recedes under the sun’s (fire) unrelenting return. As a fire goddess, the blacksmiths worshiped her, as did the housewife with her hearth-fire and the poet, the filid and the bard, roles critical to ancient Celtic society. Brighid inspired the poets. Thus, she supported craftspersons, domestic life and the spark of genius that kept kings and the ruling class in check and still gives Ireland fame in letters to this day. She became associated with fertility, hence the ewe and the lamb in the belly. In one interpretation of the Great Wheel, the earth goes through three phases: the first, or the virgin/maiden takes prominence with the beginning of the agricultural year, Imbolc. The second, the Mother, takes the God as her husband at Beltane (May 1) and reigns over the growing season. As the harvest comes in the Cailleach, the old woman or crone, takes charge. The year proceeds in this way through virignity, motherhood and old age; a procession repeated over and over, as this archetypal linking of the year and the maturation of humanity repeats over and over in human society. On this February 1st, as the business cycle continues its skid, the Great Wheel can teach us that the cyclical nature of human events will right this plunge and prosperity, too, will return. You might see the business cycle as going through its crone phase, except the crone was a wise woman and as near I can tell this phase of the business cycle represents foolish men. Time has many puzzling aspects, not the least is its appearance of linearity while we experience, too, and more profoundly, its cycles. I see the cyclical nature of time as more true to my experience and more hopeful. The Great Wheel, the natural cycle, does not require a cataclysm at the end to right injustice and imbalance, as do faith traditions invested in chronological time. Each year each season brings its own opportunities for renewal, for celebration and each season is only that, a season. In regular succession the next season will come. This is the great and wonderful gift the Great Wheel can bring to your life, if you let it. *Breo Saighead, or the “Fiery Arrow or Power,” is a Celtic three-fold goddess, the daughter of The Dagda, and the wife of Bres. Known by many names, Brighid’s three aspects are (1) Fire of Inspiration as patroness of poetry, (2) Fire of the Hearth, as patroness of healing and fertility, and (3) Fire of the Forge, as patroness of smithcraft and martial arts. She is mother to the craftsmen. Sons of Tuireann: Creidhne, Luchtaine and Giobhniu. Excalibur, King Arthur’s sword, was forged by the Lady of the Lake, a figure sometimes associated with Brighid because of her fire and forgery aspect. Like the Arthurian Avalon, or “Isle of Apples,” Brigid possessed an apple orchard in the Otherworld to which bees traveled to obtain it’s magickal nectar. Brigid, which means “one who exaults herself,” is Goddess of the Sacred Flame of Kildare (derived from “Cill Dara,” which means “church of the oak”) and often is considered to be the White Maiden aspect of the Triple Goddess. She was Christianized as the “foster-mother” of Jesus Christ, and called St. Brigit, the daughter of the Druid Dougal the Brown. She sometimes also is associated with the Romano-Celtic goddess Aquae-Sulis in Bathe. Brighid’s festival is Imbolc, celebrated on or around February 1 when she ushers Spring to the land after The Cailleach’s** Winter reign. This mid-Winter feast commences as the ewes begin to lactate and is the start of the new agricultural cycle. During this time Brigid personifies a bride, virgin or maiden aspect and is the protectoress of women in childbirth. 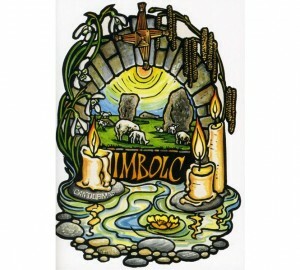 Imbolc also is known as Oimelc, Brigid, Candlemas, or even in America as Groundhog Day. As the foundation for the American Groundhog Day, Brigid’s snake comes out of its mound in which it hibernates and its behavior is said to determine the length of the remaining Winter. Gailleach, or White Lady, drank from the ancient Well of Youth at dawn. In that instant, she was transformed into her Maiden aspect, the young goddess called Brigid. Wells were considered to be sacred because they arose from oimbelc (literally “in the belly”), or womb of Mother Earth. Because of her Fire of Inspiration and her connection to the apple and oak trees, Brighid often is considered the patroness of the Druids. **Cailleach is referred to as the “Mother of All” in parts of Scotland. Also known as Scotia, she is depicted as an old hag with the teeth of a wild bear and boar’s tusks. She is believed to be a great sorceress. One superstition regarding Calliach is that the farmer who is last to harvest his grain would be the person to “look after” Caileach for the rest of the year, until the next harvest. The first farmer who finishes harvesting would make a corn-dolly from the grain he has harvested. He would, then, pass it on to the next farmer who finishes. It would keep going until the corn-dolly ends up with the last farmer. That last farmer would be obligated to watch the “old woman”.